Former Montreal Expos great Tim Raines will be inducted into the Canadian Baseball Hall of Fame tomorrow in a ceremony in St. Marys, Ont. (Photo courtesy of Canadian Baseball Hall of Fame). * Writer’s Note: This is my last in a series of “Things you might not know …” articles about this year’s Canadian Baseball Hall of Fame inductees. This year’s Hall of Fame induction ceremony will take place tomorrow at 11 a.m. in St. Marys, Ont., on the museum’s ceremonial grounds. Admission is free. Born in 1959 in Sanford, Fla., Tim Raines blossomed into one of the best leadoff hitters in major league history. 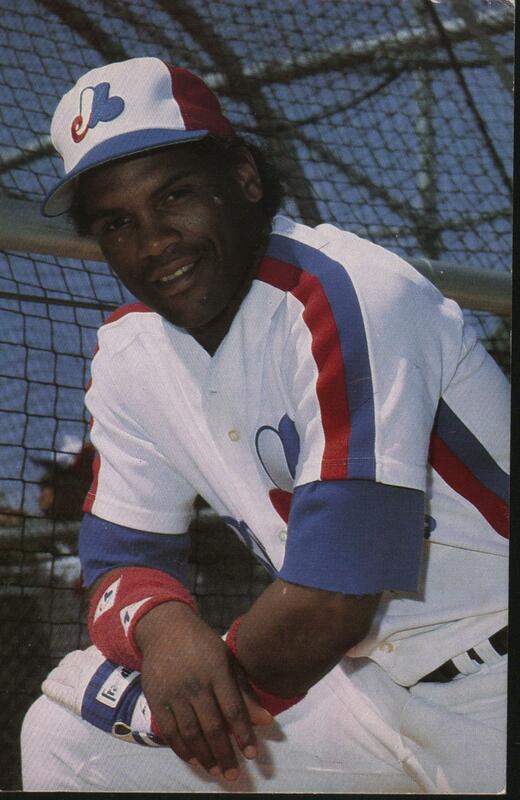 A fifth-round pick of the Montreal Expos in 1977, Raines excelled for parts of 13 seasons in Canada. From 1981 to 1987, the fleet-footed outfielder was selected to seven consecutive all-star teams and was named the MVP of the 1987 Midsummer Classic. During that same period, he also won a National League batting title in 1986 and topped the Senior Circuit in runs twice and in stolen bases four times. In December 1990, Raines was dealt to the White Sox, where he toiled for five seasons, before being traded to the New York Yankees, where he earned two World Series rings (1996, 1998). In 2001, he returned to the Expos and hit .308 in 47 contests. In all, in a 23-year big league career – that also included stints with the Oakland A’s, Baltimore Orioles and Florida Marlins – Raines collected 2,605 hits and 808 stolen bases (fifth all-time). Following his playing career, he coached and managed in the Expos organization and his No. 30 was retired by the club in 2004. Raines has also served as a first base coach with the White Sox and is currently a minor league baserunning and outfield instructor with the Blue Jays. First MLB Hit: July 25, 1980. Starting at second base and batting third for the Expos that day, Raines registered an infield single off of Houston Astros right-hander Bert Roberge in the sixth inning at Olympic Stadium. The Astros won the game 9-8. First MLB Home Run: May 1, 1981. Hitting leadoff for the Expos and playing left field, Raines’s first big league homer was a walk-off belt off of Dodgers righty Bobby Castillo in the 13th inning at Olympic Stadium to give the Expos a dramatic 9-8 win. Best MLB Game: August 16, 1987. Raines recorded five hits and hit for the cycle against the Pittsburgh Pirates in an Expos’ 10-7 triumph at Olympic Stadium. Raines had two doubles, a triple, a homer and a single and scored four runs in the contest. Raines also belted three homers for the Chicago White Sox in their 12-1 drubbing of the Boston Red Sox at Fenway Park on April 18, 1994. He also scored five runs that game. Canadian Pitcher(s) He Liked to Face: Right-hander Paul Quantrill (Port Hope, Ont.). Raines had three hits in eight at bats against Quantrill, but all three hits were home runs. Raines was also 2-for4 off of Denis Boucher (Montreal, Que.). Canadian Pitcher He Hated to Face: Right-hander Fergie Jenkins (Chatham, Ont.). Raines had just four hits in 20 at bats against Canada’s only Cooperstowner. Last MLB Hit: September 29, 2002. Suiting up for the Florida Marlins in his final big league season, Raines’s last big league hit was a single off of Phillies right-hander Joe Roa in the third inning at Pro Player Stadium in Miami. The Marlins won the game 4-3. Last MLB Home Run: May 24, 2002. Pinch-hitting for Marlins’ reliever Oswaldo Mairena in the ninth inning, Raines socked a game-tying home run off of Mets closer Armando Benitez at Shea Stadium. The Mets, with Canadian Baseball Hall of Famer Roberto Alomar scoring the winning run, rebounded to win the game 5-4 in 10 innings. – In the July 25, 1980 game that Raines registered his first big league hit in, three other Canadian Baseball Hall of Famers were in the Expos lineup: Andre Dawson (batting fourth), Gary Carter (batting seventh) and Steve Rogers (batting ninth and the starting pitcher). All of them registered at least one hit in that game. The Expos were battling the Astros who had Canadian Baseball Hall of Famer Terry Puhl (Melville, Sask.) batting leadoff and playing right field. Puhl clubbed a home run off of Rogers in the ninth inning. Cooperstowner Nolan Ryan started that contest for the Astros, but lasted only 4-1/3 innings, Raines failed to record a hit off of Ryan, but he did reach base on an error by Astros first baseman Enos Cabell and stole second in the fifth inning. – Raines made his big league debut for the Expos in 1979 and was used almost exclusively as a pinch-runner. As a result, his stat line for that season is fascinating: 6 games, 0 at bats, 3 runs, 2 stolen bases. – Raines’s first stolen base came off of St. Louis Cardinals catcher Ted Simmons in the ninth inning of a game on September 15, 1979. Cooperstowner Tony Perez walked and Raines ran for him. Gary Carter then laid down a sacrifice bunt to advance Raines to second. Expos right-fielder Ellis Valentine was then intentionally walked and Raines and Valentine orchestrated a double steal. The Expos eventually won the game 2-1 in 11 innings. – Raines homered in the same game as fellow 2013 Canadian Baseball Hall of Fame inductee George Bell twice. You can read a blog entry about those games here. – As noted above, Raines’s first MLB home run was hit on May 1, 1981 at Olympic Stadium, George Bell belted his first big league round-tripper just nine days later at Exhibition Stadium in Toronto. What great information Kevin. THanks. You dig deep.